More than a week ago BtcRush joined Sticky Listing on DavidNews.com. Since the first day on our monitor, the program has been working well and it has status “Paying”. Last week I published a review about BtcRush. 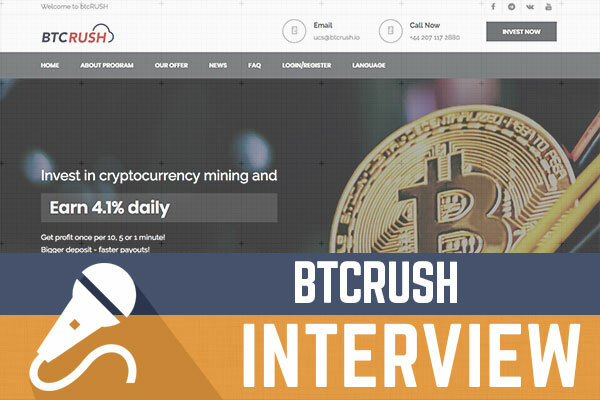 However, considering how popular cryptocurrency mining programs are at the moment, I thought it would be interesting to do an interview with the admin of BtcRush. No matter if you hear about BtcRush for the first time or have already made a deposit in the program, keep reading to get an insight from the admin. Please introduce yourself to DavidNews.com blog readers and tell us more about your project? My name is Jaylon, I’m COO at BtcRush, the most progressive cloud-mining investment program. What makes BtcRush different from many other cryptocurrency mining projects? BtcRush is the first cloud-mining company giving 4.1% daily profit with unlimited withdrawals a day, and paying once per 10, 5 or 1 minute. There are no more investment companies who achieved such a goal, and we’re very proud of this. Which cryptocurrencies BtcRush does mine and why? Besides Bitcoin we’re currently mining about 20 altcoins such as ETH, LTC, DASH, NEO, IOTA, EOS, Waves, XMR and its forks etc. According to your website the company was established back in 2016. What do you think is the future of cryptocurrency mining and why people should get involved? In our team we are all real cryptocurrency enthusiasts, and we believe that cryptocurrencies is a future of money. We’re completely sure that cryptocurrency mining is the new way and a chance for small states to develop faster. Just have a look at Venezuela experience with national cryptocurrency or such tiny country as Belarus that has officially legalized the mining business. The fact that cryptocurrencies will cost much more in future is undoubted. But they are doing more, I'd say they are breaking the rules and stereotypes established in the world economy. People should get involved just because in the nearest 10-15 years cryptocurrencies will displace fiat money completely, and the earlier they accept it and learn how to deal with it, the more valuable their experience will be. On the website, you provide a short insight into you mining farms. 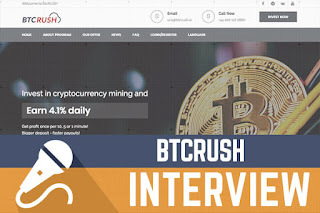 How and why BtcRush chooses mining farm location? This is pretty hard process I’d say. Finding a proper place in a city is almost impossible, because our farms require better ventilation that is available in old industrial premises. But if you build one far away from civilization, you will get other problems such as drainage and electricity. Thus we’re trying to find a balance. But these farms you see are a successful experiment. They are very expensive and built far away from civilization, but we have chosen such places where we can use alternative energy for mining: we get it from wind and water. That made the mining process cheaper and allowed us to quickly recouped our loses. What about BtcRush website and investment security. How do you ensure website security? We accept both cryptocurrency and AdvCash/PerfectMoney deposits directly without any payment aggregators or getaways, that makes it much more secure for our clients to keep and use their funds. The website of BtcRush is available in 6 different languages. Which are the most represented countries in terms of investors? The major part make Asian investors, then goes Russia and then we have Africa and Europe. BtcRush has been online for a week now and you already have more than a thousand followers both on Facebook and Vkontakte. What’s your approach to social media marketing? Social networks are created for communication. That’s why we use them not just for formal presence, but we allow our clients to communicate there, and we are communicating with our investors too. Just have a look at our pages: we usually share not just company official materials, but users’ reviews and opinions about us. We do it also in YouTube and thinking about launching an Instagram account as well. We’re open-minded and transparent, that what is necessary for social networks. Tell us more about BtcRush investment offer. Why do you describe it as ideal for everyone - from new investors to the crypto-currency business sharks? Concerning the sharks, they value our dynamics because nobody besides them understands very well what the speed and flexibility mean in cryptocurrency business. Every minute charges along with unlimited withdrawals allow people to withdraw profits once the price of certain cryptocurrency is suitable for trading. Thus our program allows to earn even more during certain period of time, compared to competitors. You have chosen a less common accrual calculation method - the accruals are charged by equal parts every 10, 5 or 1 minute. Why you use this approach? How investors benefit from it? We know the needs of contemporary investors and fulfill them. Modern world likes dynamics, and we just follow the latest trends in the investment market. Briefly explain BtcRush 7 Day bonus system and how DavidNews.com readers can to take part in it! The bonus system is intended to unleash the potential of our active investors who like earning even more. The 7 Bonus Quest stages involve all investor's skills and opportunities: making pictures, recording videos, advertising in social networks and messengers, referrals recruiting. For each task made an investor gets a new bonus. Tell us more about BtcRush statistics – first, how big are deposits (the biggest and the average amount) and what are the most popular payment options? Well, the leading cryptocurrency is Litecoin. But these days we’re about to open the ETH deposits at last and I’m completely sure that it will become the most popular among cryptocurrencies. When it comes to fiat payment systems, AdvCash is much more popular than PerfectMoney. Concerning the biggest deposit, it's 24,3 BTC and $38,700 in US Dollar. The average one might be between $200 and $300, I suppose. I’d like to catch this opportunity and announce that right after ETH deposits we’re about to add one more fork or fiat currency. We’re going to launch a survey among our investors to learn which one is the most desired. Your predictions for the next year in the HYIP industry. Any advice to potential investors about evaluating HYIP’s? The HYIP’s as they are, they'll continue existing while people are interested in high yield investments. The task is to provide people with real and 100% legal programs that make it possible to get better profit compared to these traditional options we have today. And this is completely possible when comes to cryptocurrencies. And BtcRush mining company is a proof! Is there anything you would like to tell DavidNews.com readers and potential investors? I dare say that we’re the most client-oriented and the most profitable cloud-mining company you have ever seen, and I'd like to invite everybody to come and test our investment platform. I’m sure you'll like it!